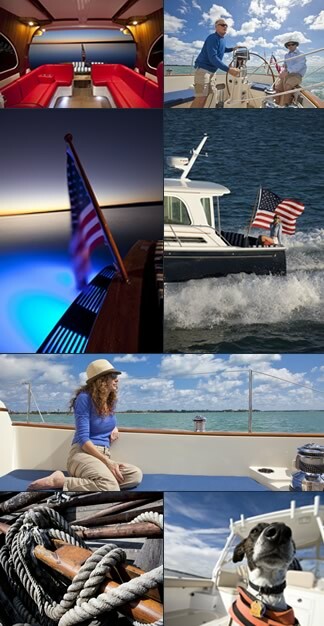 Why Use a Certified Professional Yacht Broker? becoming a well informed and educated consumer. The selection of a professional yacht broker will provide an invaluable tool in facilitating an ideal closing. Thinking about Selling? Latitude is the Right Brokerage Firm for You! will be handled efficiently, with your interest as the primary objective. Determining Your Boat’s Value and Setting an Asking Price. Many sellers going through the selling process unaided make the mistake of setting an unrealistic price that doesn’t reflect true value, and then question why their boat isn’t selling. price. Knowledge of your boat’s true value and setting the asking price is the most analytical and critical decision in executing an efficient sale and securing the maximum financial benefit. During the selling process, the more informed you are, the better decisions you’ll make in determining your bottom line. How to NET the Best Price When Selling Your Boat? Advertising and Marketing…Exposure is Key! Advertising is a crucial component to maximum market exposure. Creation of a detailed listing containing high quality photographs, detailed specifications, notable features, vessel status, location, and all of the most important information. A contemporary website promoted on the top search engines with maximum optimization built in. Internet-based global advertising to put your boat in front of as many buyers and brokers as possible. Premier International MLS databases – YachtWorld, Yacht Council, and Marine Source – the most successful, worldwide multi-listing Internet services, attracting the largest percentage of buyers and brokers. Optimum exposure on social networking sites such as Facebook, Twitter, LinkedIn, and YouTube. Year-round Boat Show participation for face-to-face promotion of your boat to as many buyers and brokers as possible. Direct Mailing and Newsletters to thousands of prospective buyers. Periodic ads in Soundings, Wind Check, Points East, and Nautical RI. Direct marketing to regional marinas and boat yards. Placement of “For Sale” signs on your boat. Networking with other brokers to co-broker and sell your boat. promote your boat and encourage buyers to want to learn more. Professional Know-How – On Your Behalf. Be available seven days a week, providing timely responses to all inquiries. Provide the “Face Time” at the showings, answering all questions, and promptly reporting back to you. Prepare the listing for distribution to the market and to other brokerage firms, boat yards, and marinas. Represent you in the negotiating process with the buyer or buyer’s broker in reaching a “Fair” Price and agreement in terms. Understand the marine brokerage profession, i.e., all documents and contracts needed to register and transfer titles and safeguard funds. Coordinate and represent you in attending the sea trial and marine surveys, assisting you in addressing any deficiencies discovered, and reviewing what is best to focus on during negotiations. Hold deposit funds in a dedicated escrow account. Provide all documentation for closing and safeguard the transfer of funds. well organized, and, above all, the least stressful for you! The national Certified Professional Yacht Broker (CPYB) program is supported and sponsored by all seven of the broker associations in North America. and Gulf Coast Yacht Brokers Association (GCYBA). CPYB brokers offer considerable value to buyers and sellers, as outlined in the CPYB Value Statement. professionals (YSPs) throughout the U.S. and Canada. attaining and maintaining their CPYB certification. To learn more please visit our Sellers Guide for useful information and tips. Please click here. Complimentary Vessel Appraisal - Having trouble determining what your boat is actually worth? Let us help. We have experience and resources available to determine a fair value for your vessel.